I am the Master and Goddess of All Gnome-kind. St. Paul, Minnesota Has a Gnome Restaurant You Gotta Check Out! Now more than two years into my nomadic journey as a full-time RVer traveling around the country, I sometimes find myself missing the gnome collection that I’ve been growing since my teenage years. There aren’t a whole lot of places to decorate with gnomes when your home is 33 feet long by eight feet wide, so the bulk of my collection is locked up in a storage unit. I’m sure they’re doing okay, but I’ll admit that I worry about them from time to time. 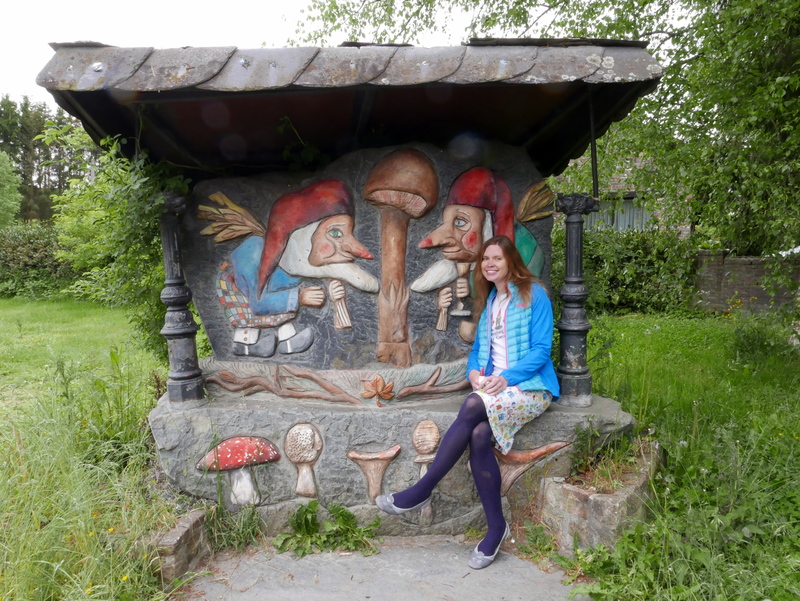 Although I don’t have the pleasure of spending time with as many gnomes as I’d like to these days, I make up for that by visiting gnome-themed places around the country! 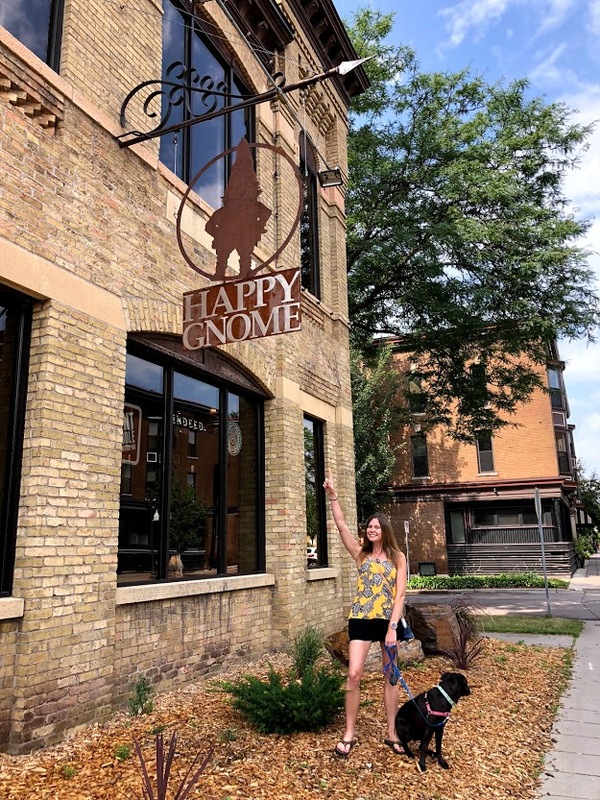 My latest gnometastic adventure was to a restaurant called The Happy Gnome in St. Paul, Minnesota. It’s easy to name a restaurant after gnomes because it’s clever, but this local spot really embraces its love of gnomes in the décor and overall theme. 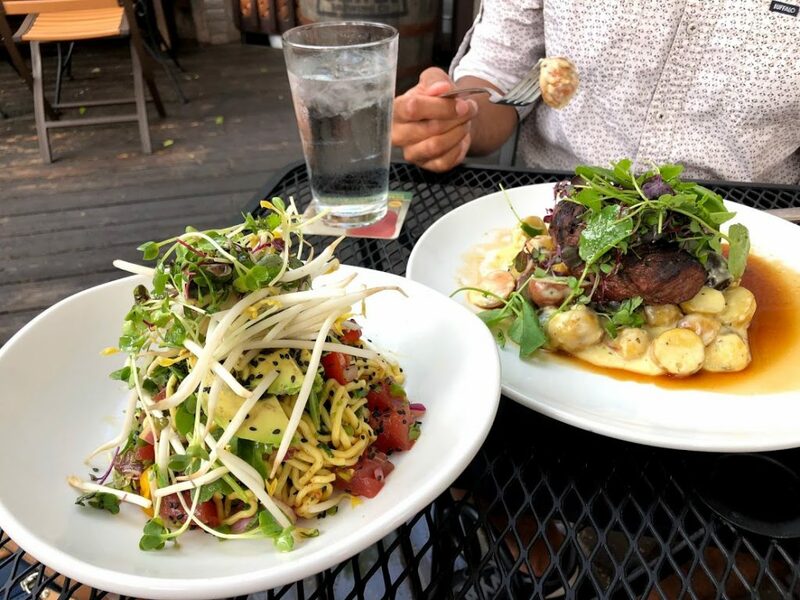 The Happy Gnome has been in business for over 10 years and focuses on fresh and seasonal cuisine with local ingredients and a creative flair. The restaurant also has about 90 craft beers on tap, as well as a whiskey list with over 250 selections. I’m a pescatarian and my husband loves all-things-meat, but The Happy Gnome gave us the best of both worlds with an ahi tuna noodle bowl for me and a sirloin steak for him. 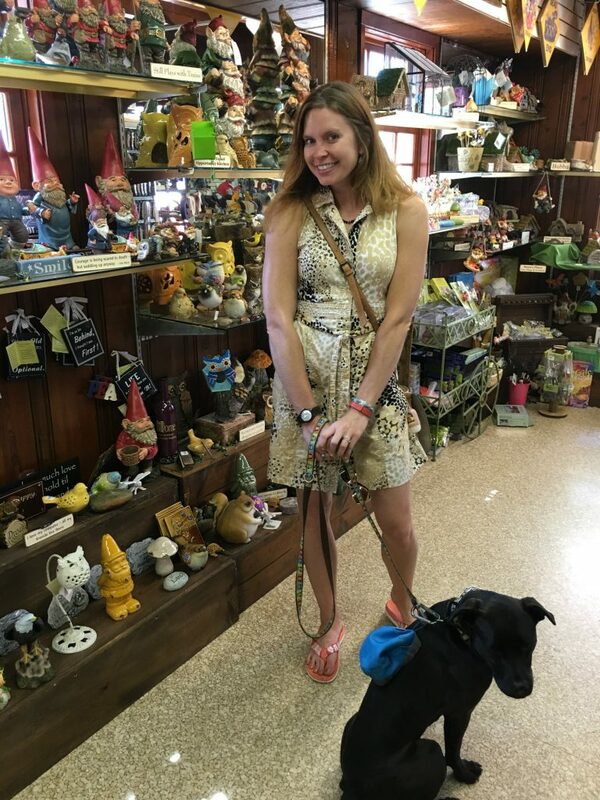 Better yet, The Happy Gnome’s outdoor patio is dog-friendly, so our pup, Monkey, got to enjoy this gnome adventure right alongside us! 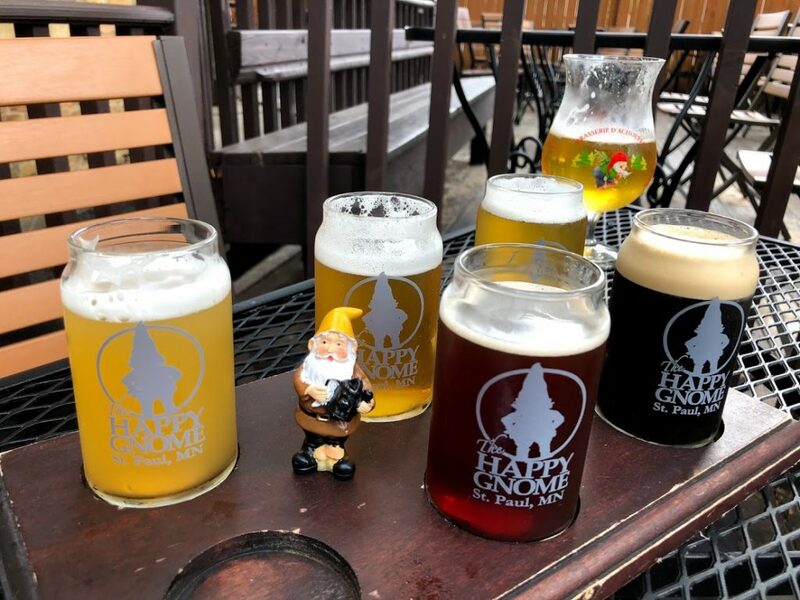 In addition to the delicious food, excellent selection of Belgian beer, and relaxing patio atmosphere, what I really loved about The Happy Gnome is how many gnomes call this restaurant home. Gnomes were everywhere you looked – from the menu to the glassware, the beer taps, in the windowsills, and sitting around the fireplace. My only complaint was that they didn’t have any merchandise available for sale, because I would have loved buying a souvenir from this awesome place. So, if you ever find yourself in Minnesota, do yourself a favor and stop by The Happy Gnome. Your taste buds will thank you, and you’ll meet lots of little gnome friends to make your meal special. Unfortunately, the restaurant didn’t have any gnome friends that I could take along with me on my journey, but it made ME a happy gnome to be surrounded by such friendly faces. Located in the Cathedral Hill Neighborhood at 498 Selby Avenue in St. Paul, The Happy Gnome is open on Sundays from 10am to midnight, Mondays through Thursdays from 11am to midnight, and Fridays and Saturdays from 11am to 1am. 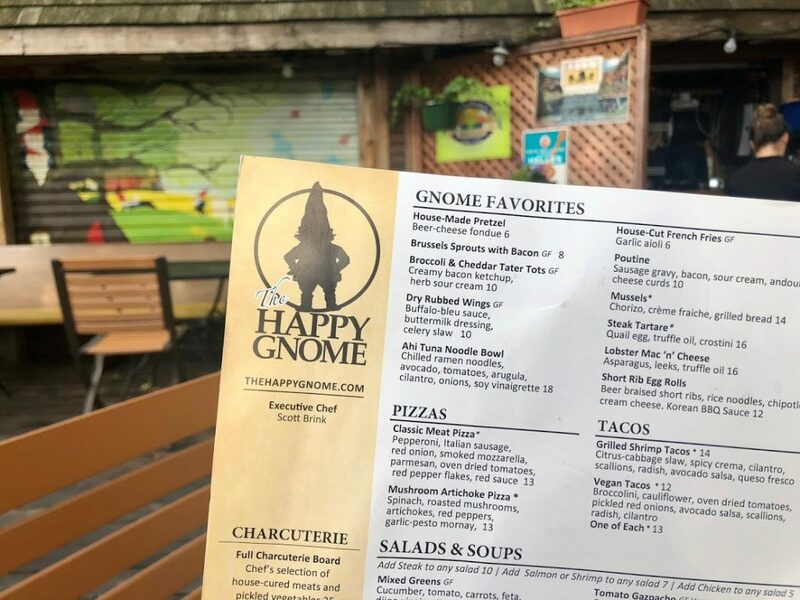 In our last issue of Gnome News, I highlighted some of the best gnome-themed restaurants and breweries around the country. Since that time, I’ve had the opportunity to visit one of these amazing places! To visit family and friends for Christmas, I embarked on a cross-country road trip from Arizona to Georgia and Illinois with my husband and pup. A quick look at a map revealed that we would be traveling near Wichita, Kansas, which is the home of Hopping Gnome Brewing! It was a clear and chilly Wednesday night when we rolled into town after driving for over eight hours. Hopping Gnome Brewery is located in the Douglas Design District of Wichita and got its start with a Kickstarter campaign a few years ago. I was a bit disappointed to learn that the owners, Torrey and Stacy Lattin, aren’t gnome collectors or as obsessed with gnomes as me. Instead, the inspiration for the brewery’s name came from a gnome giveaway from a Kansas City Royals All Star game. “How about Hopping Gnome? You know like hops, and gnomes are known for drinking?” Torrey asked his wife. 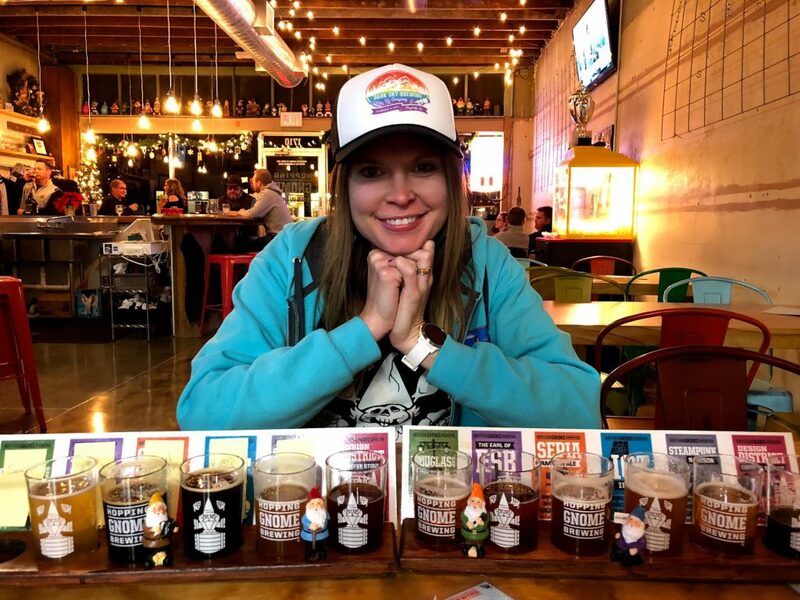 Regardless, this brewery really embraces its gnome theme and is completely decked out with gnome décor and gnome-inspired merchandise. 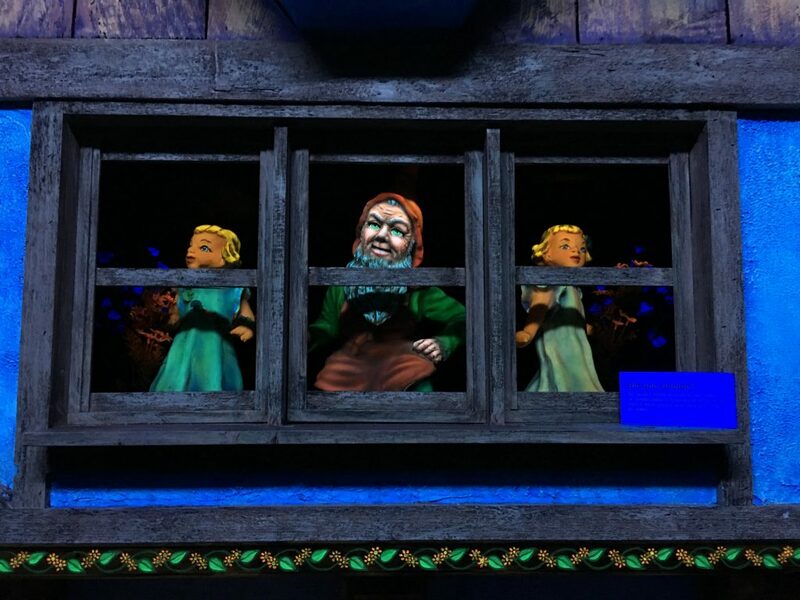 The illuminated sign outside instantly welcomes all gnome lovers, and there’s a long row of gnomes waiting to meet you inside near the ceiling. 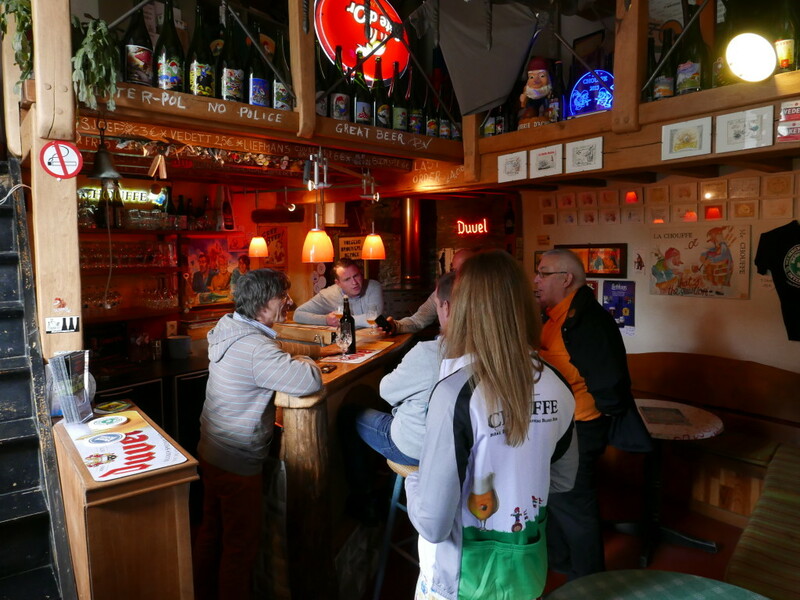 Pages of Wil Huygen’s iconic book, Gnomes, are displayed at the bar, and gnome artwork adorns the walls. Since it was the holiday season, there was also a Christmas tree decorated with gnomes. 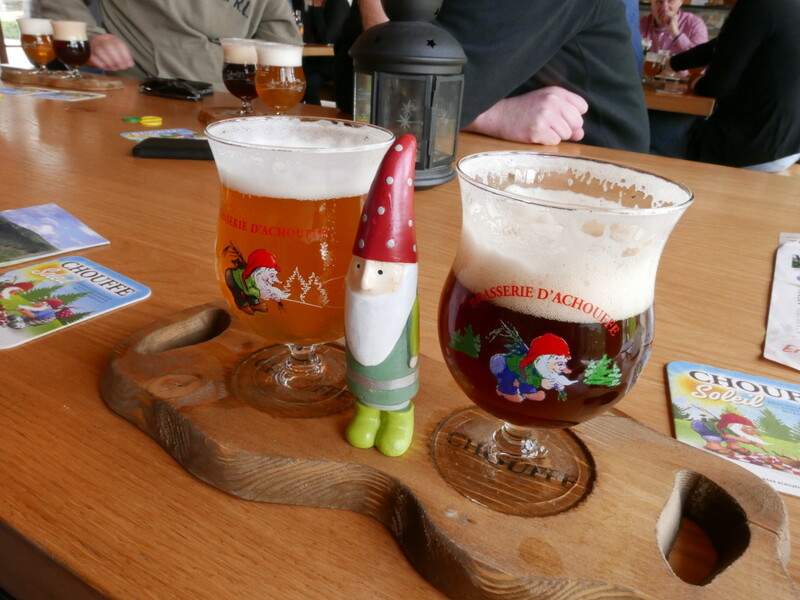 All of the beer glasses feature the brewery’s gnome logo, which made the delicious brews taste even better. We ordered a flight of beers to sample each and every one. My two favorites were the Barrel Aged Coffee Stout and the Rollergirl RyePA. The brewery doesn’t serve food (other than some tasty free popcorn), so we ordered a couple pizzas from Piatto Neapolitan Pizzeria next door. I highly recommend the Mushroom Medley with sautéed cremini, white, and shiitake mushrooms! I spent several hours at the Hopping Gnome, taking a million pictures and chatting with the staff about all things gnome-related. The brewery also has free Wi-Fi (the password is GnomeBeer1) and some fun card games and board games to play. 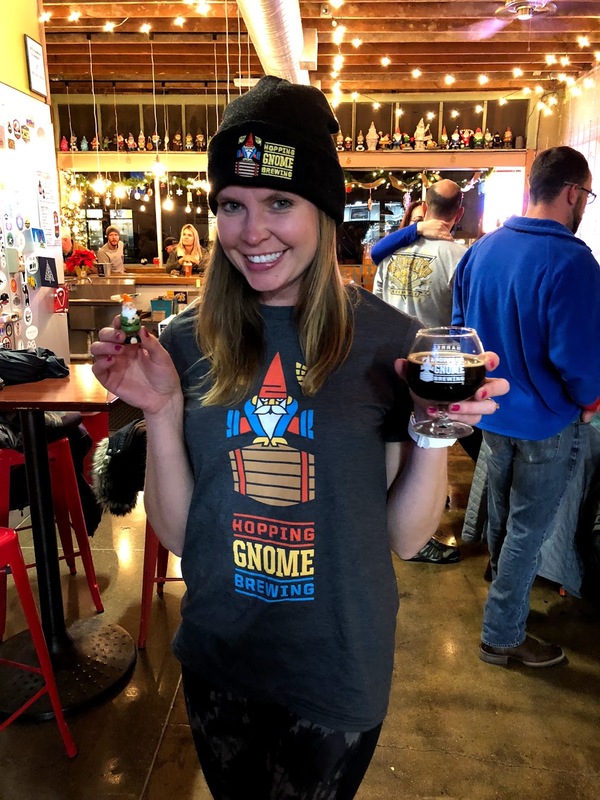 To savor all these fond memories, I visited the brewery’s little merchandise section to stock up on gnome gear – a t-shirt and beanie hat that I wear pretty much every day now. 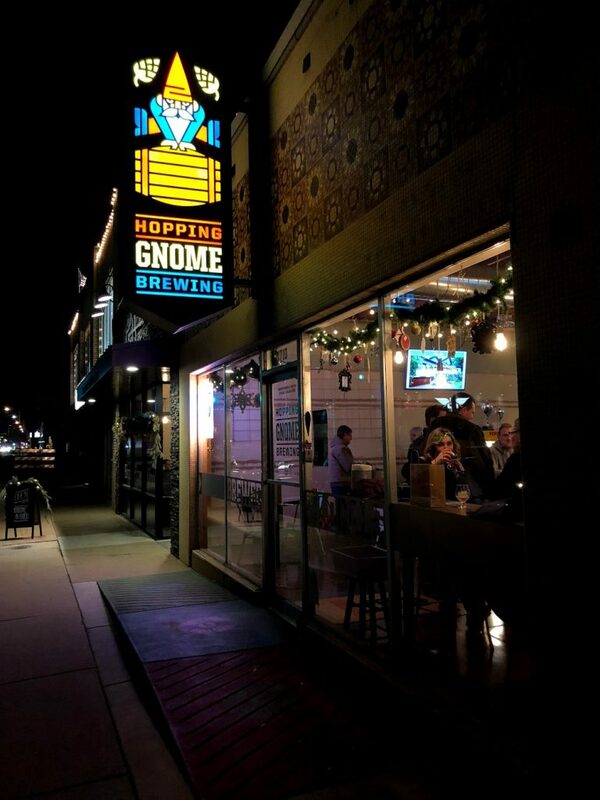 So, if you ever find yourself in Kansas, make sure to stop by the Hopping Gnome and say hello! 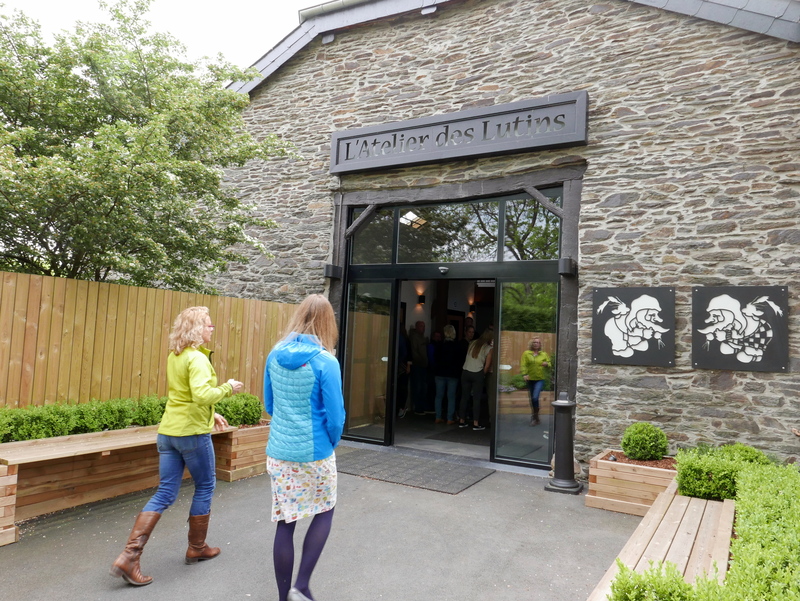 The brewery is open Wednesdays through Sundays and is well worth the trip! Not many people have heard of Wellington Mill or Dardanup, tiny towns south of Perth on the great island continent of Australia. That was, anyway, until a group of gnomes decided to take up residence here and capture the imagination of people all over the world! It’s a mystery how Gnomesville originally began. Some rumors say that a gnome-repairwoman started the trend to decorate a section of road, while others believe that a gnome was left behind to “stand guard” at a dangerous traffic intersection. Originally seen as a form of protest art, it’s much more of a tourist attraction today. 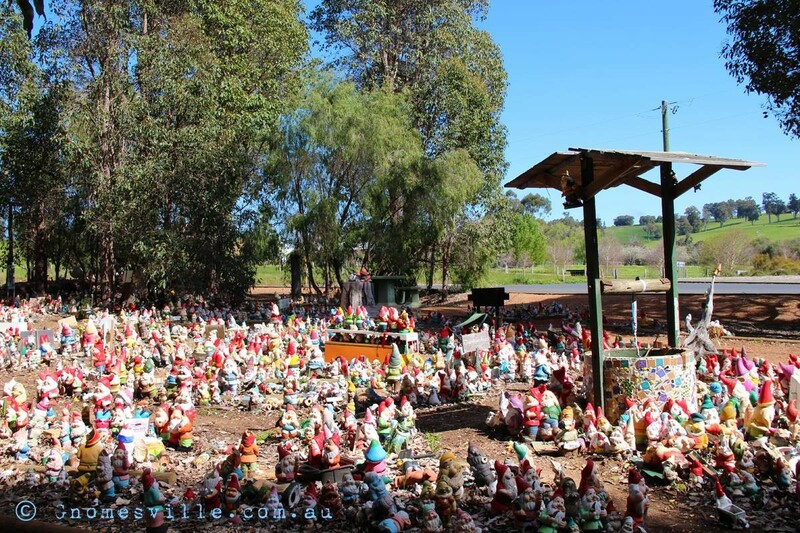 There have been over 7,000 gnomes that call Gnomesville home, and this population is growing by the day. 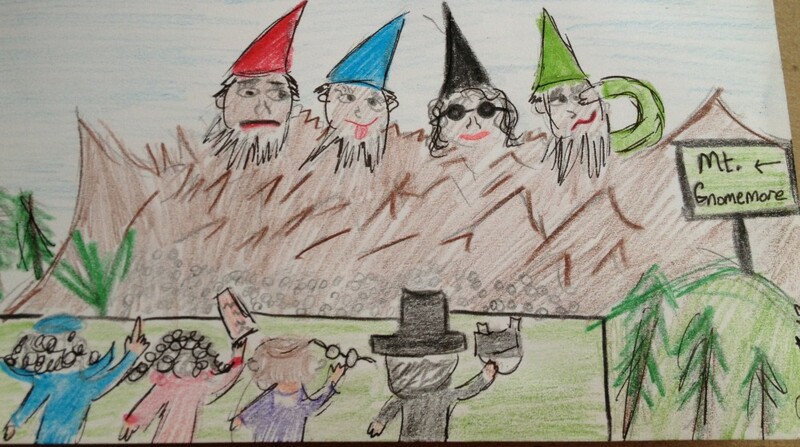 The gnomes’ population grew so much that they threatened to distract drivers passing by. But they were promptly moved back a bit to habitats for everyone’s safety. Just like any population center, there are good gnomes and bad gnomes here. Some play professional football, others are partying, some are flying planes, and a few are being punished in a fenced-in detention center. It’s a surreal and blissful spectacle full of bad puns (E.T. phone gnome! ), political advocacy, and pure silliness. Gnomesville has been around since the 1990s and has suffered from floods, storms, and vandalism. But the resilient gnomes have persevered, and new ones are being added to the collection by local and international visitors. 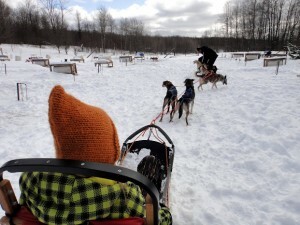 Meanwhile, local news stations and bloggers from the region continue to cover the happenings at Gnomesville with a sense of wonder and childlike enthusiasm. Gnomesville is located on the Eastern Junction Roundabout of Wellington Mill Road and Ferguson Road in Wellington Mill, Western Australia 6236. I have yet to travel to Australia and see Gnomesville for myself, but I hope to in the near future! In the meantime, you can keep up with what the red-hatted ones are doing by following their website and Facebook page. 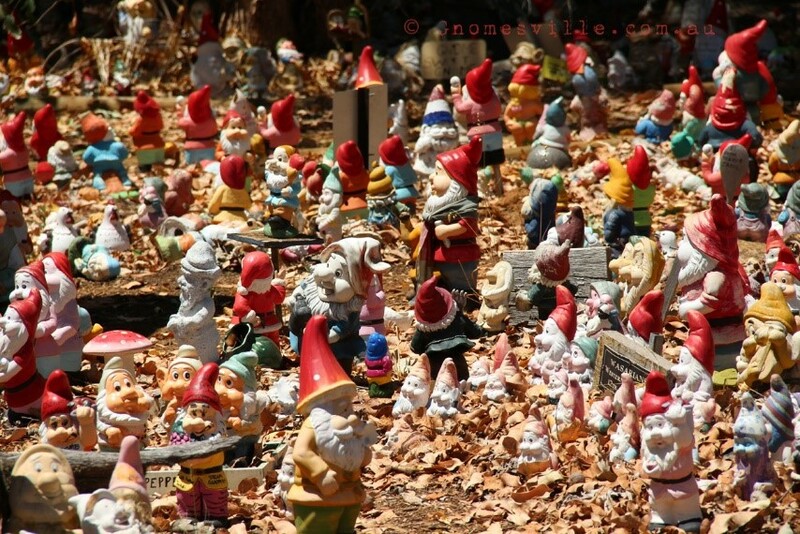 If you’ve visited the gnomes of Gnomesville, please share your thoughts and photos with us! *Disclaimer: This article was written by a non-gnome human, named Alyssa, who is obsessed with gnomes and travel. The opinions expressed here do not necessarily represent those of Drunk Gnomes, but they probably do anyway because they’re awesome. On a recent drive from Illinois to Georgia, I made a pit stop in Chattanooga, Tennessee and decided to check out the famous attraction advertised on all the highway billboards: Rock City. Much to my delight, the nature paths and caves here are filled with gnomes! 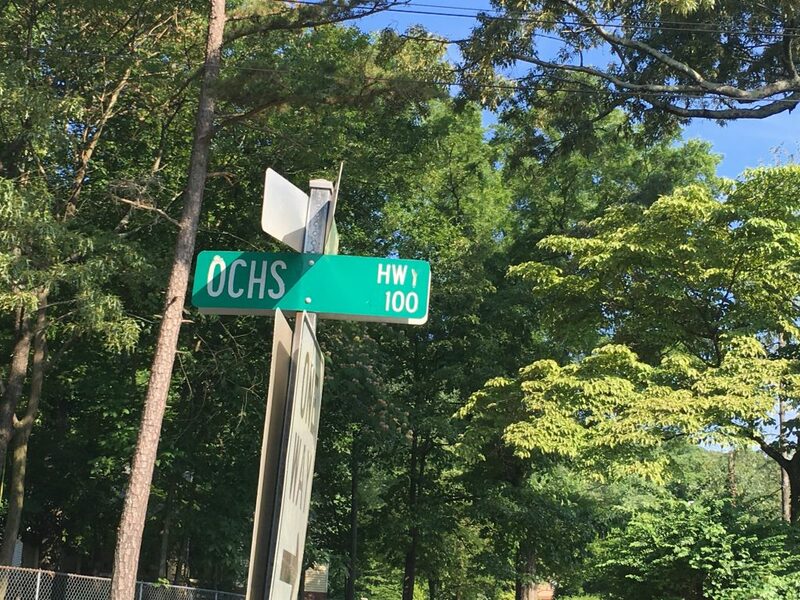 I knew I was in for something special when the road leading up to Rock City was called “Ochs Highway.” No joke. Clearly, this place was meant for me. In the late 1920s, Garnet and Frieda Carter began developing a walkable garden on their private estate to share their love for the region’s rock formations and native plants with the public. The husband-wife team opened Rock City Gardens during the Great Depression and had over 800 barns painted to advertise and attract tourists to Chattanooga. 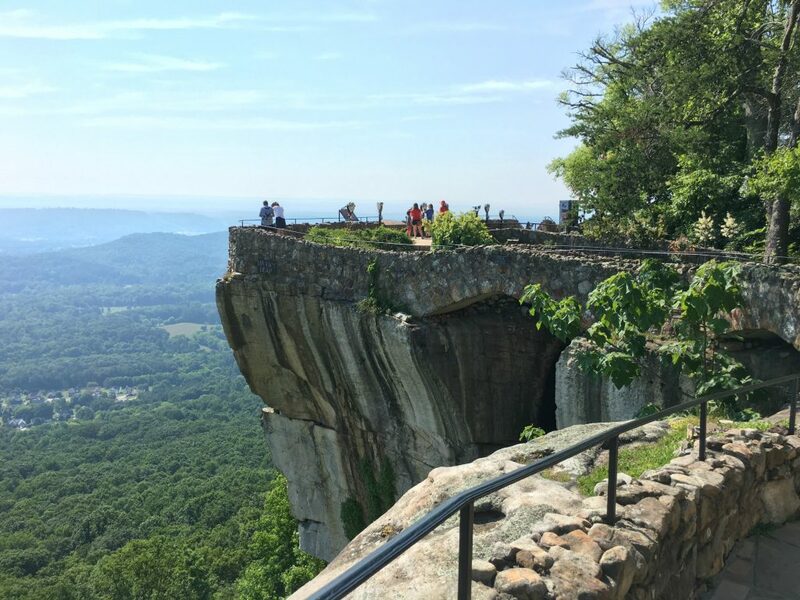 They gave the attraction its name because the rocks on top of Lookout Mountain looked like city buildings and the natural pathways like streets. Frieda Carter loved European folklore and fairytales, and she was an avid gnome collector. 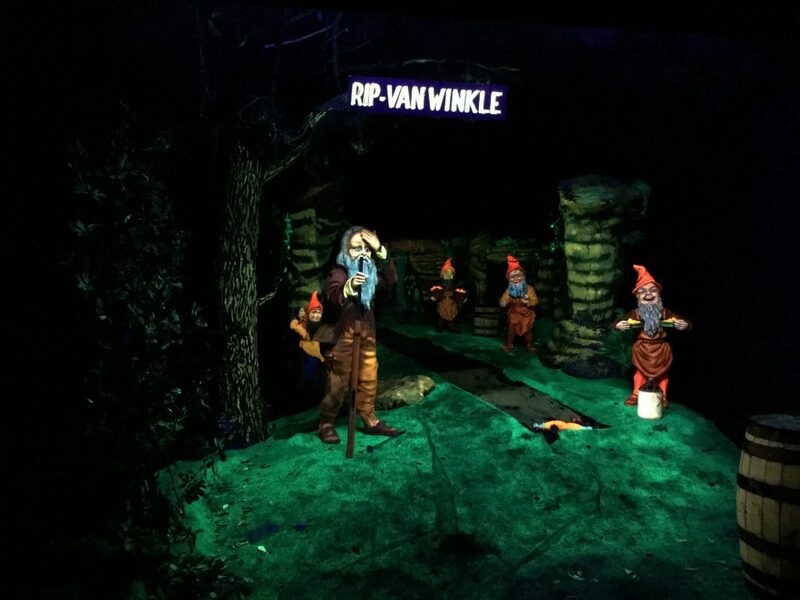 So naturally, many of her gnomes made it into the local attraction. Your gnome journey begins at the new Gnome Valley installation, which is a growing collection of whimsical space at the beginning of the Enchanted Trail. As you walk along the beautiful and easily accessible trail, you’ll notice even more gnomes peeking behind rocks to greet you. 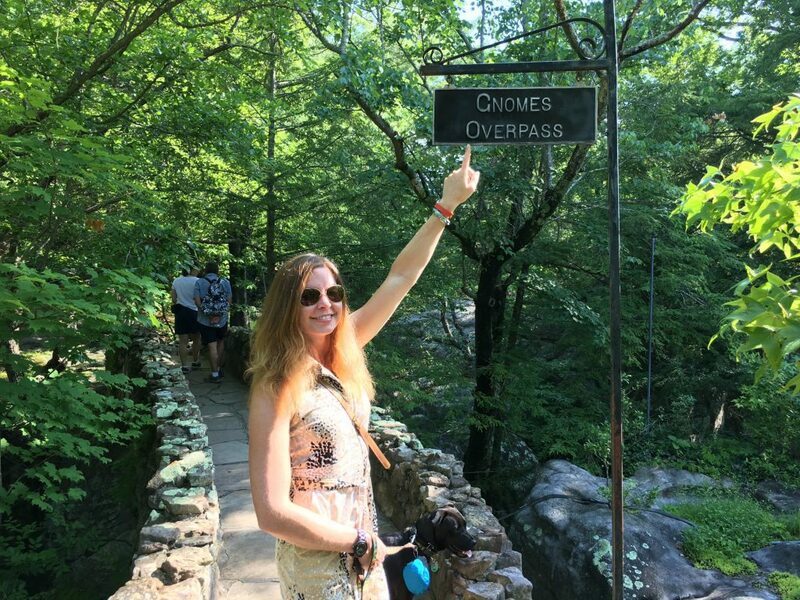 Keep an eye out for little red hats as you navigate the trail to Lover’s Leap, the 180-foot suspension bridge, Mother Goose Village, and the summit where you can see seven states on a clear day. 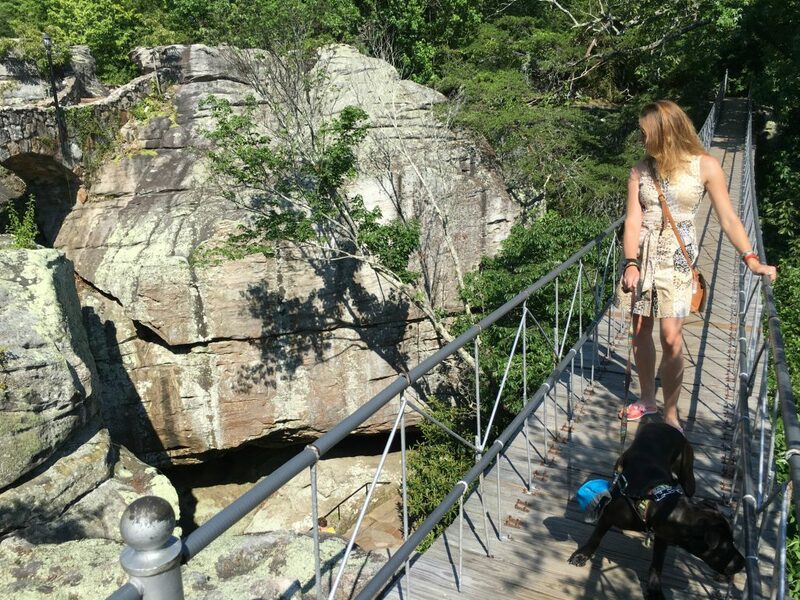 Another awesome part about Rock City is that the whole place is dog friendly! 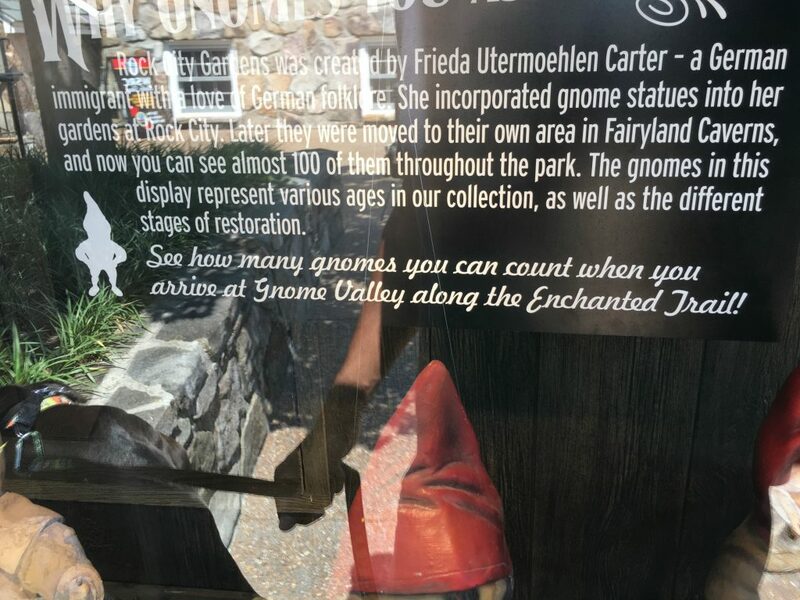 But by far, the best place to see gnomes is inside Fairyland Caverns, as this is home to Frieda’s collection of antique, imported German gnomes. 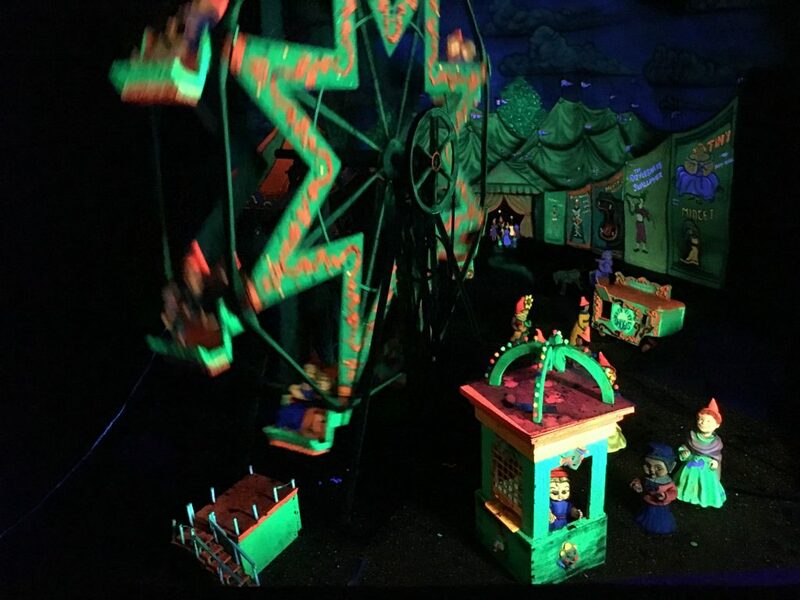 Inside this cave, gnomes are situated into scenes that are illuminated by black lights. 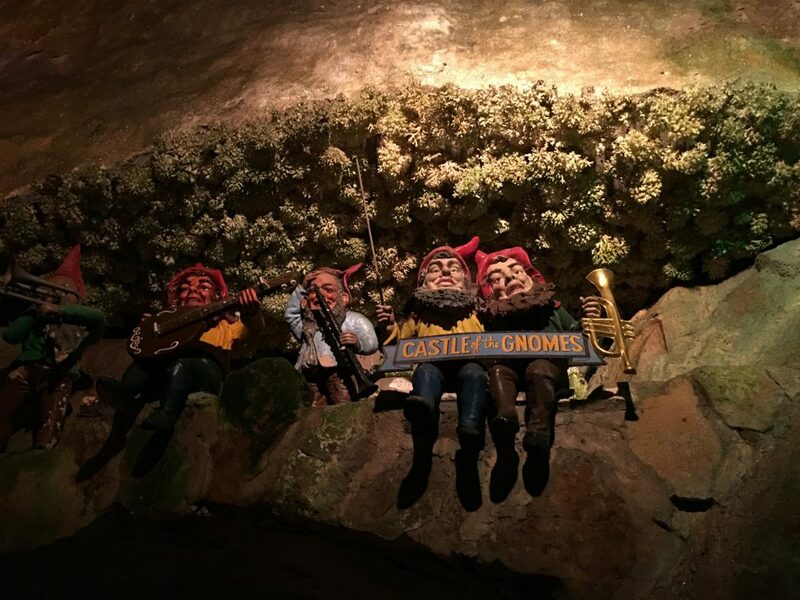 You instantly feel a sense of magic as you pass by the Castle of the Gnomes, Carnival of the Gnomes, the Moonshine-Brewing Gnomes, and many other displays. Admittedly, some of the scenes were a bit on the creepy side. But isn’t that what fairy tales are really all about anyway? Since the Rock City gnomes date back to the 1920s and 1930s, many of them were in desperate need of repair. 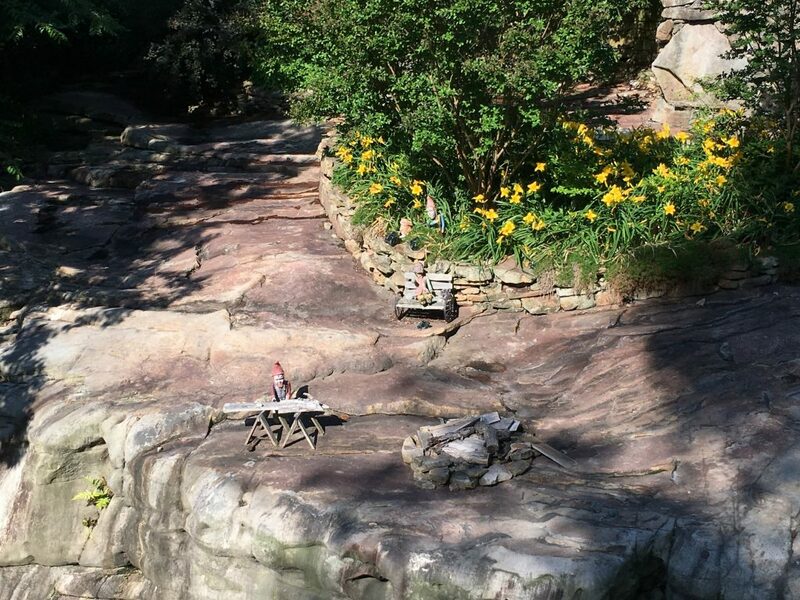 Rock City’s resident art specialist, Matt Dutton, created a “Gnome Infirmary” to restore the residents to their original splendor. Matt consults old photos to keep the gnomes’ coloring consistent, painting and repairing them as needed. He uses urethane resin and a hardener to fills his handmade molds to restore each little one’s unique personality. 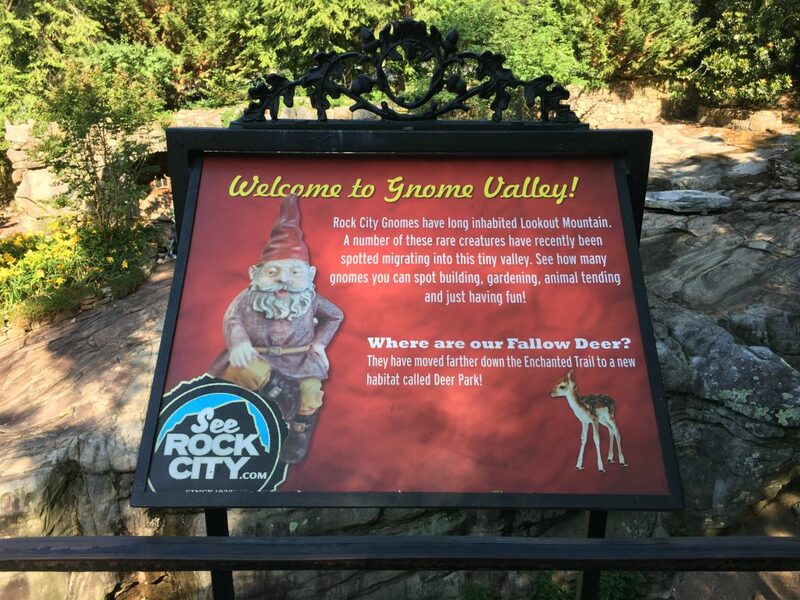 A red-hatted, white-bearded gnome named Rocky is the mascot for Rock City, and you might meet him walking around in costume! Yet no roadside attraction would be complete without a gift shop, and the one at Rock City is stocked with lots of gnomes you can take home as souvenirs. My souvenir of choice? 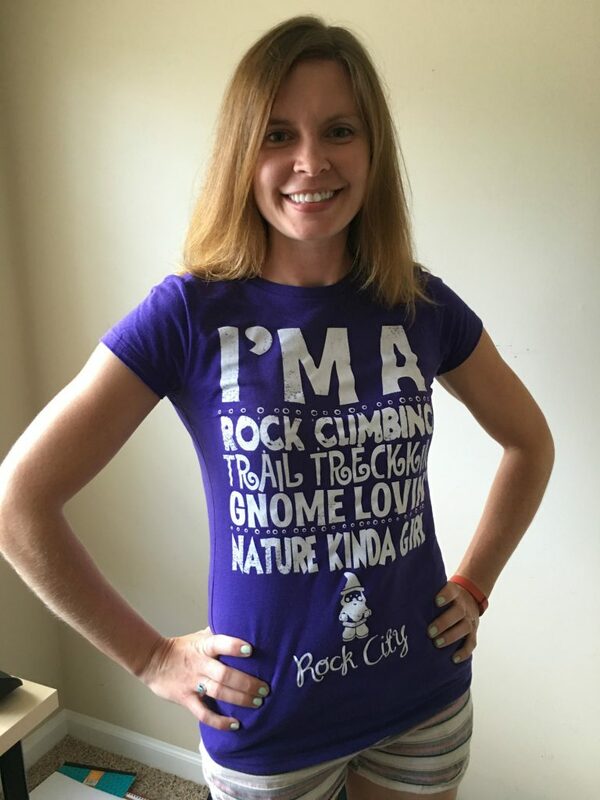 A purple t-shirt that reads, “I’m a rock climbing, trail trekkin’, gnome lovin’ nature kinda girl.” I couldn’t have come up with a more perfect motto for myself! *A version of this story is scheduled to be published in the next issue of the International Gnome Club newsletter! Several years ago while shopping at Whole Foods, I caught a glimpse of a gnome perched atop a beer tap at the grocery store’s bar. 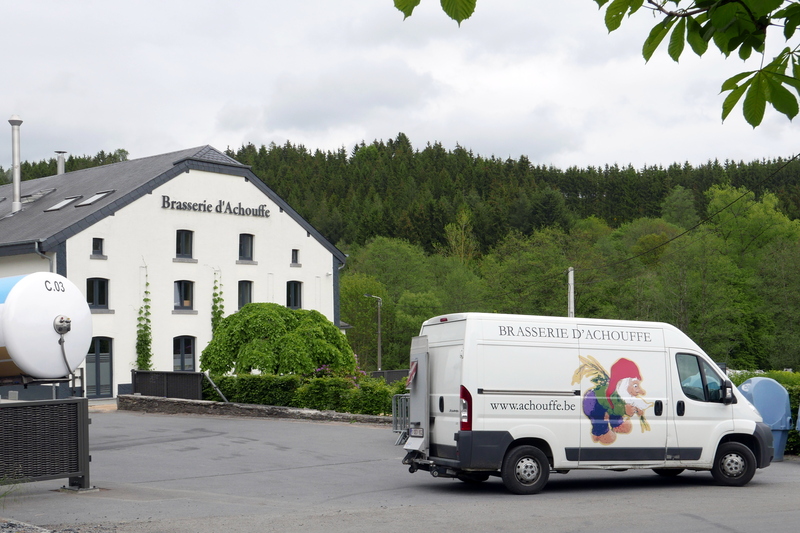 Ever since that day, I’ve been obsessed with Brasserie D’Achouffe, a gnome-themed brewery in the countryside of Belgium. 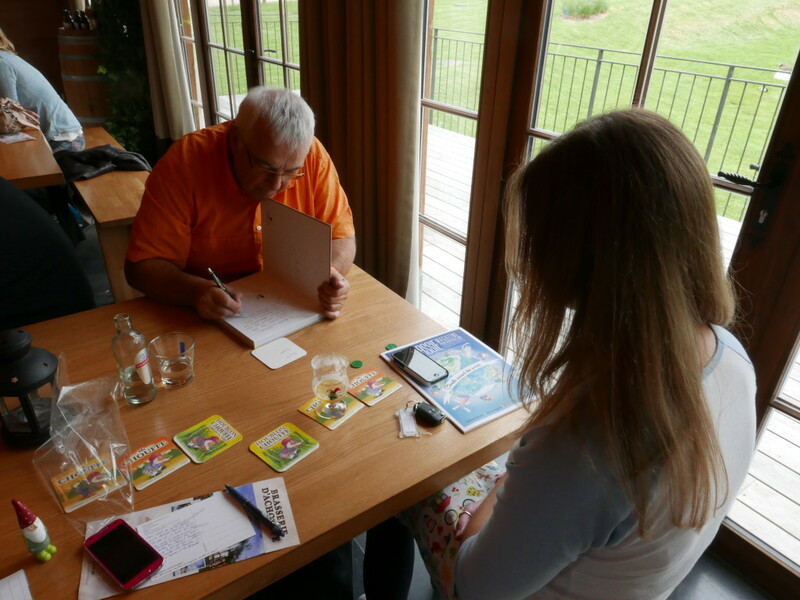 Through my gnome writings, I’ve even gotten to know the brewery’s founder, Chris Bauweraerts via email! 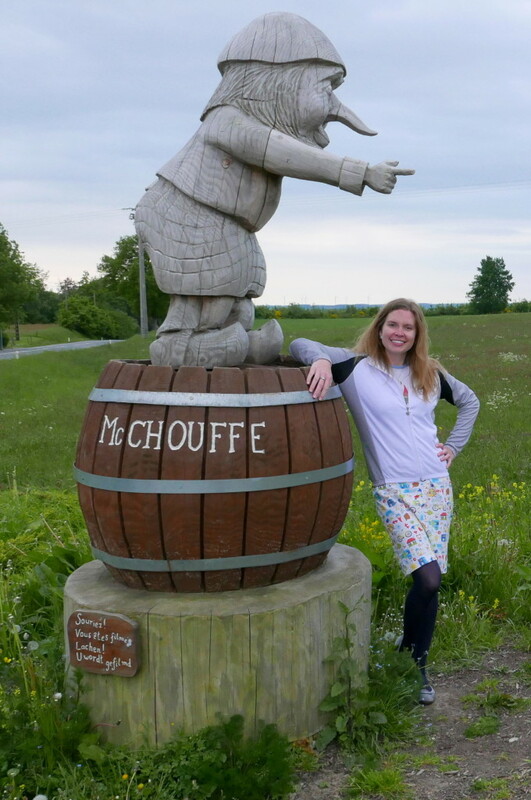 Well one of my gnome travel bucket-list dreams recently came true when I booked a trip to Belgium to visit Chris and these tiny gnome brewers. My gnome-supportive husband and I rented a car in Brussels, and drove two hours to reach the brewery in the rolling hills of the Belgian Ardennes. Belgians drive on the right side of the road, not the wrong/left side like they do in the UK, so it was pretty easy to get around. 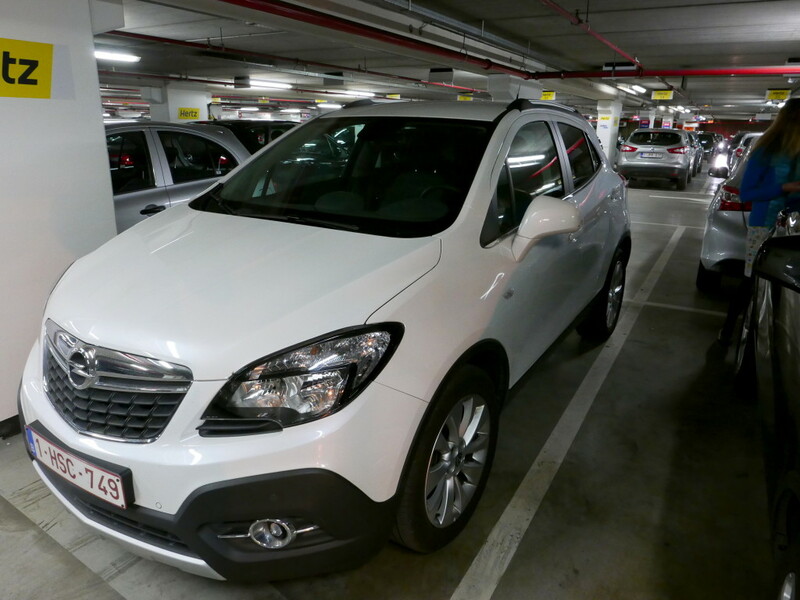 But first, we stopped in Liege, a small Belgian town on the way. 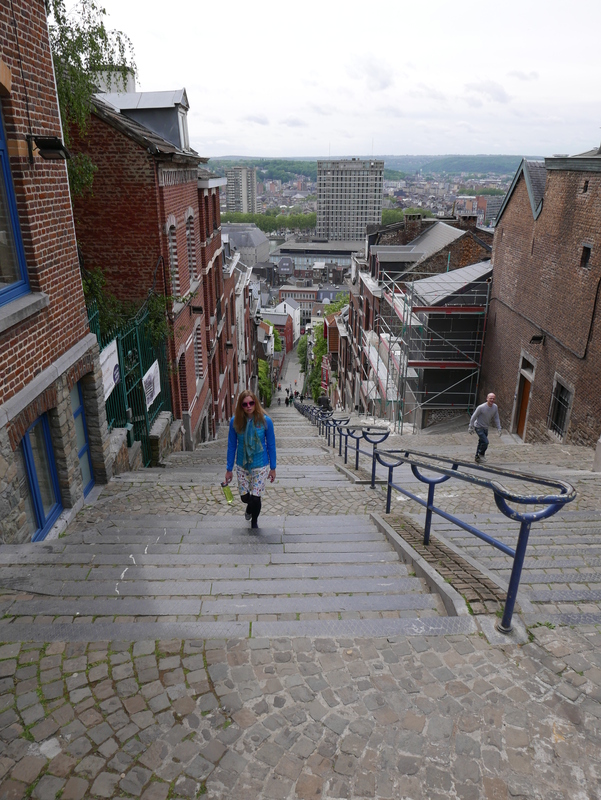 A quick TripAdvisor search told me that the top thing to do in Liege was climb the Coteaux de la Citadelle, which involves 374 stairs that lead to an awesome view of the town. 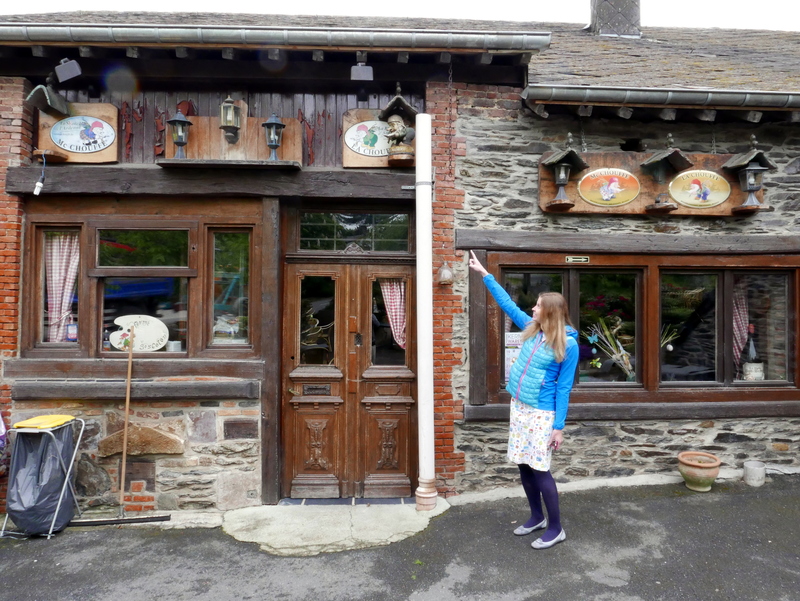 The town of Liege has an upper level and a lower level, so we wandered the streets of both, which were connected by peaceful wooded trails. Although I only had a couple hours to spend here, I’d say it was definitely a worthwhile pit stop. 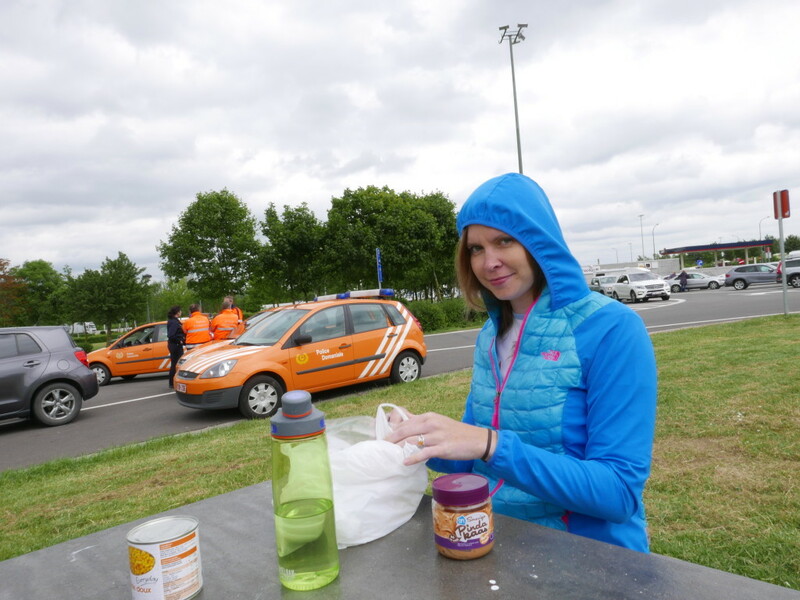 And what’s a pit stop without some sustenance?! Here’s me skeptically eating a delightful (?) lunch of canned corn and peanut butter while watching some drama go down with the local police. 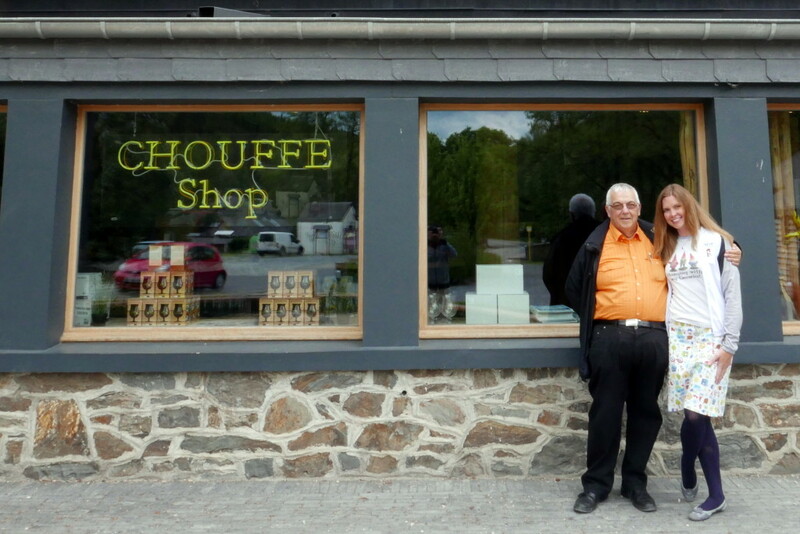 But without further delay, onward we traveled to Achouffe! The brewery location is beautiful with cutesy homes, a small lake, and gnome figures scattered all around on the walls and signs. It was a Friday afternoon and all was quiet on the gnome-front. This was fine with me, as it provided many uninterrupted photo ops with the local gnome residents. 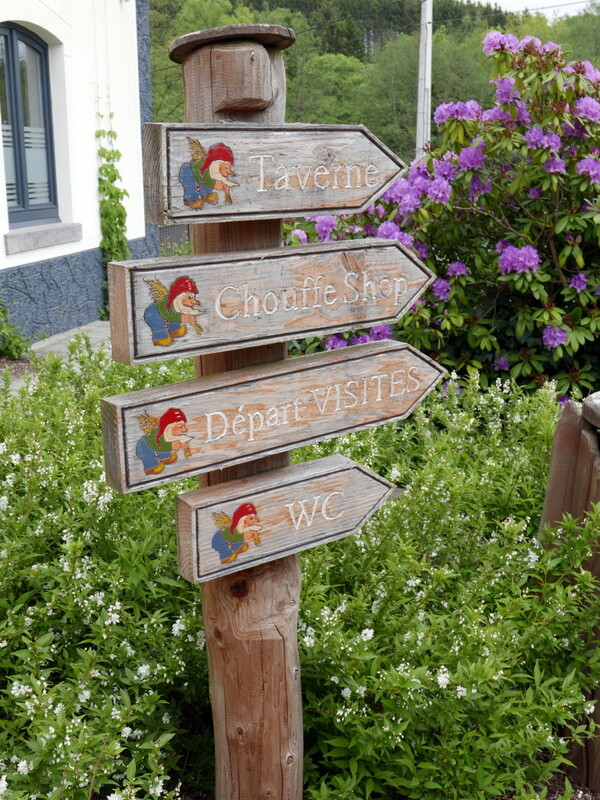 Helpful gnomes pointed us in the right direction as we explore the grounds before our scheduled tour. 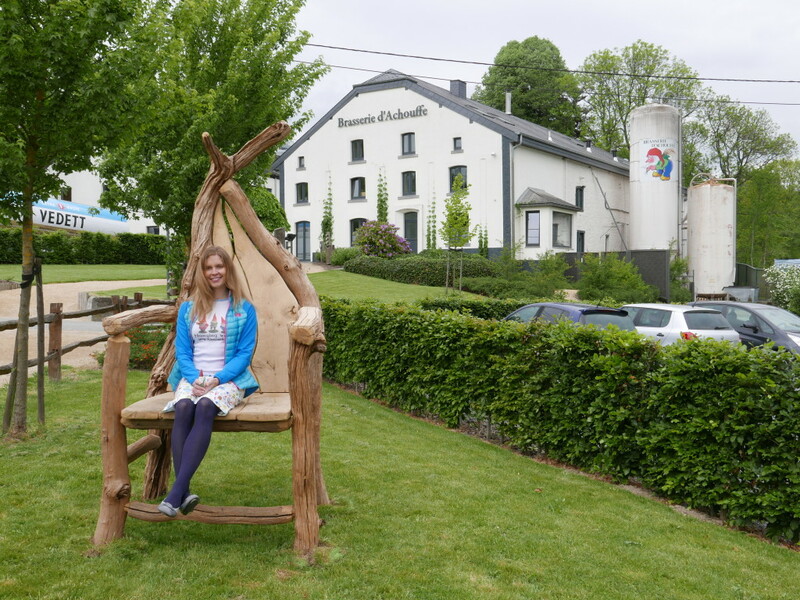 Reminiscent of that day back in Chicago when I “gnomed myself” at Chouffe Fest Chicago, the brewery had a perfectly-situated and oversized chair to hop into and feel as tiny as the gnome brewers themselves. 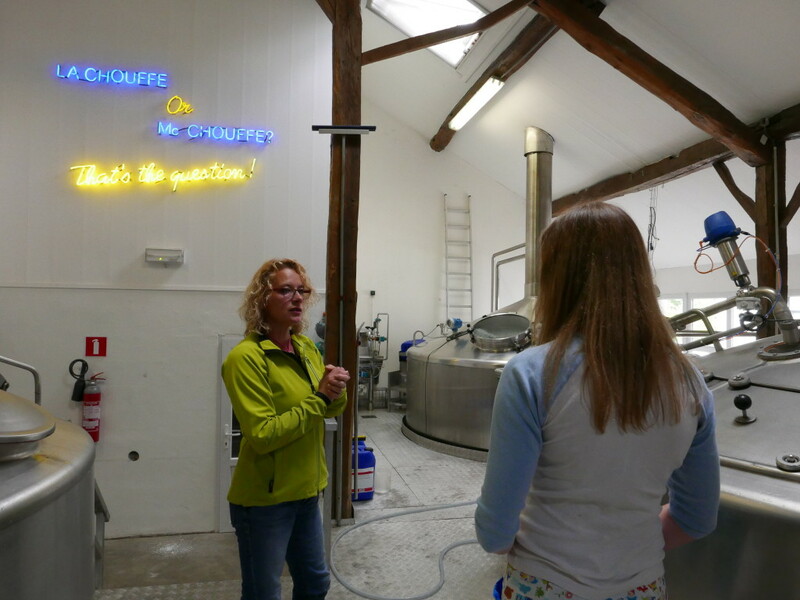 Standard brewery tours are in Dutch; however, our gracious guide, Lydia, took the time to translate everything in English just for us. We got to see the Achouffe beer-making equipment, brewing vats, and even a short film about the brewery’s history. Not surprisingly, I was captivated and enthralled during every single moment. 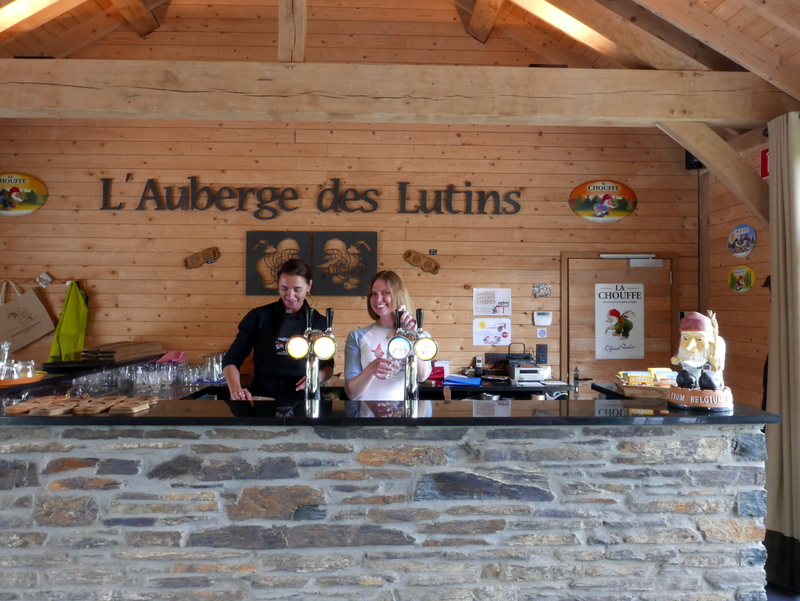 Then Lydia led us to the tasting room to sample all the Chouffe specialties: the traditional blonde (La Chouffe), decadent brown(Mc Chouffe), hoppy IPA (Houblon Chouffe), and fruity summer beer (Chouffe Soleil). I must reveal that I’m a bit of a craft beer connoisseur, and even if gnomes weren’t on each label, these would still be some of my all-time favorites! I even got to play bartender for a bit! Could a full-time gig and relocation to Belgium be in my future? 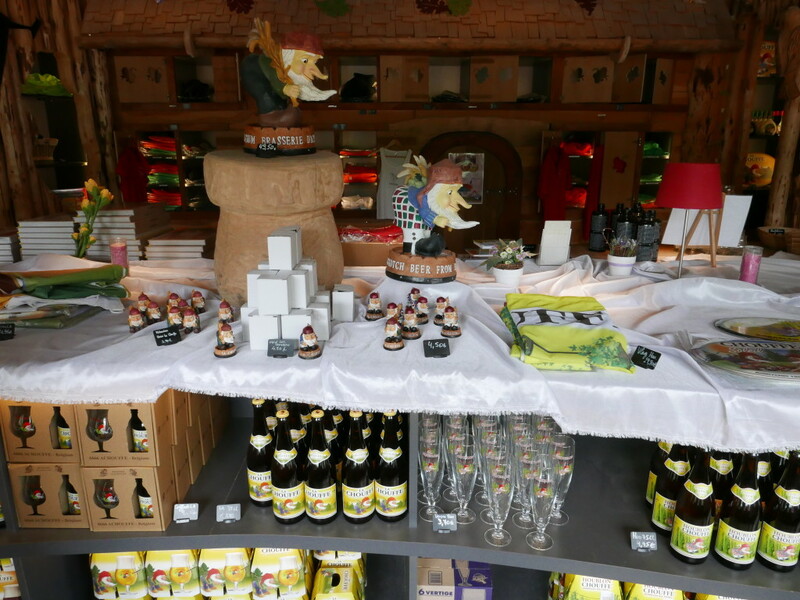 Although the staff gave us complementary glasses and postcards, I quickly found myself stocking up on gnome gear at the souvenir shop. I’m now the proud owner of a long-sleeved Chouffe bike shirt, wall plaque, key chain, and zip drive! But the highlight of my brewery visit was meeting and spending time with the owner and founder, Chris. I could not have asked for a more welcoming and hospitable host! 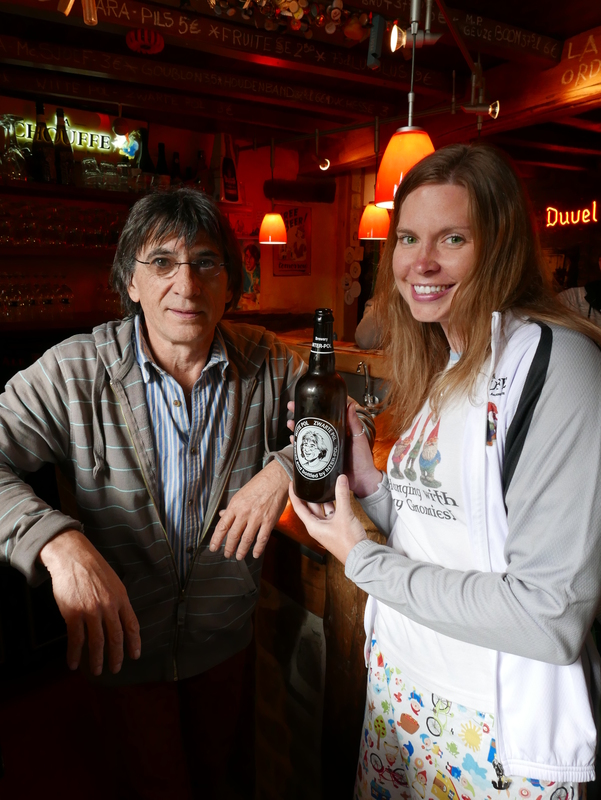 Chris published a book, called My Chouffe Story, which details how the brewery began in 1982 and how the gnomes became such an important part of the brewing process. He gave me a signed copy of his book as a gift, a memento I will always treasure. Chris went out of his way to make us fall in love with the Belgian countryside, taking us to some of his favorite places in the area. We followed Chris, (in his orange shirt and orange car…a fellow fan of everything orange, like me!) to a nearby bed, breakfast & brewery, La Vieille Forge, which is known as the tiniest brewery in Belgium. By the way, the concept of a BB&B is amazing and there should be more of these…EVERYWHERE. I got to meet the mastermind behind Brewery Inter-Pol and sample his two original beers, which were delicious. I really just wanted to stay at this tiny country pub for a while with the super-friendly locals and crash overnight at the B&B, but alas, all the rooms were booked for a biking event in the area. Maybe next time. 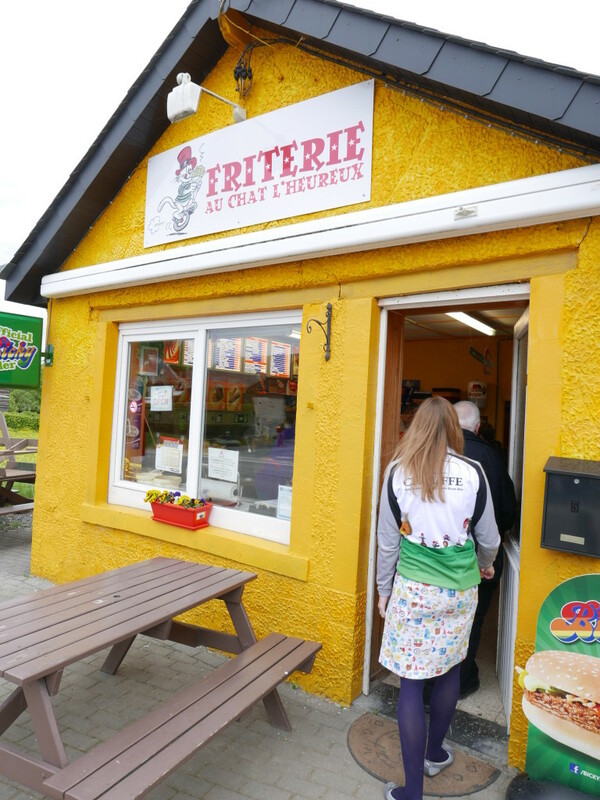 After reluctantly leaving the tiny brew pub, Chris took a traditional kebob & fries restaurant, Friterie Au Chat l’Heureux, to fill up our stomachs after all that awesome beer. There were a few too many choices for my overloaded brain at this point in the brew-fueled day, but was finally able to decide on an order. Whew. Fries are a big deal in Belgium, and although I tend to avoid the greasy specimens back in the States, I felt obliged to give ’em try on this side of the pond. I can’t deny that they were a tremendously satisfying post-beer snack. Good thing I’d been averaging 10 miles of walking per day! 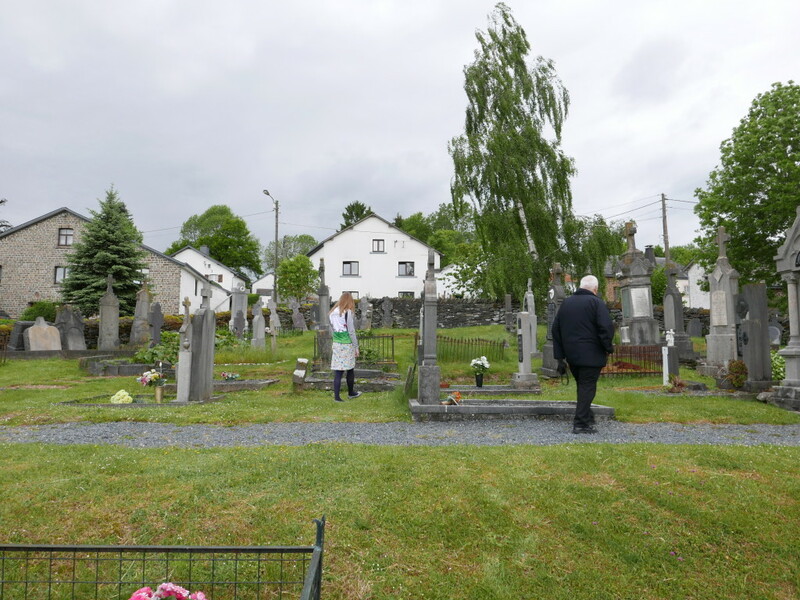 Chris knows the ins and outs of everything in the Belgian Ardennes…even the history behind an old cemetery that we stopped to check out along the road. In caravan-style, we spent our afternoon following him to a few of his other favorite places in the area, including a WWII site, scenic nature sites with yellow wildflowers, the production & bottling facility, and a local pub. Gnome and beer enthusiasts truly are the friendliest people in the world, and I’m so happy to have hundreds of photos (literally, hundreds) to remember my gnome-tastic day forever. 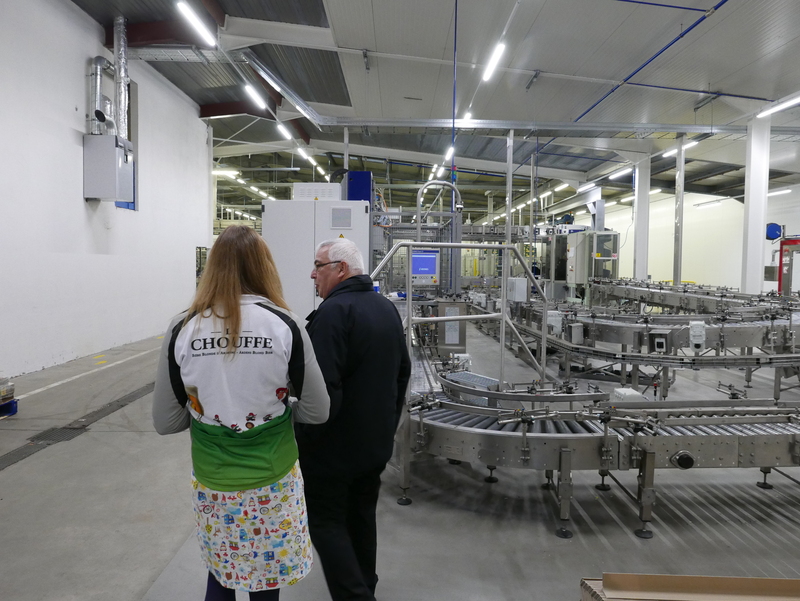 A big thanks goes out to Chris, Isabelle, Lydia, and all the Chouffe staff for making my gnome brewery visit absolutely perfect. Cheers! 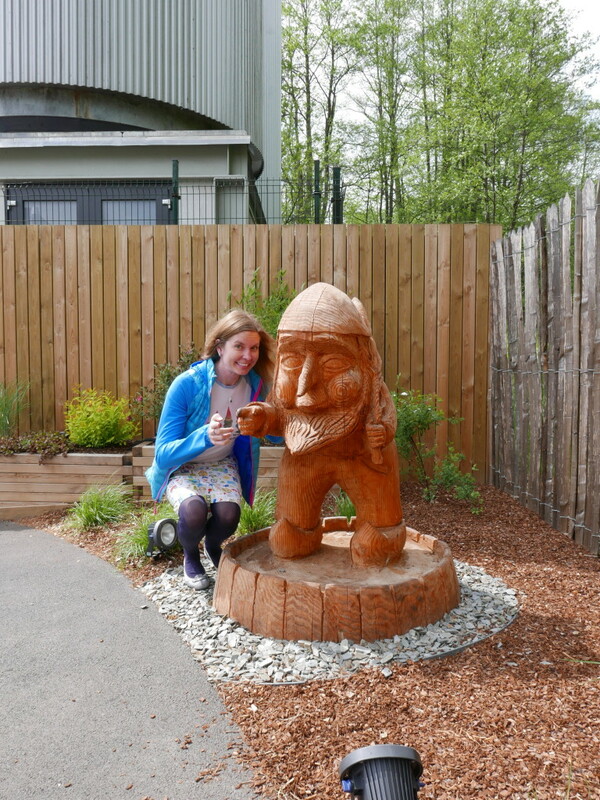 *A version of this story is published in the current edition of the “International Gnome Club Newsletter.” Drop a line to President Liz Spera at [email protected] to become a member of our club and keep up with gnome enthusiasts like me!